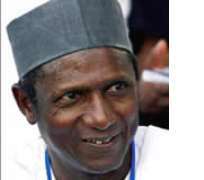 Nigeria's Attorney General and Minister of Justice, Micheal Aondoakaa (SAN), has affirmed that the President and Commander in Chief of The Federal Republic of Nigeria, Alhaji Umaru Musa Yar'Adua, is hale and hearty. A statement from the office of the AGF signed by his Special Assistant, Honourable Onov Tyuulugh, yesterday evening noted: "We have received with great shock and dismay the rumours making the rounds about the state of health of Mr. President and wish to state that the President has gone to Saudi Arabia for routine medical check." He said it is normal for the President to embark on routine medical trip and to also go on vacation, stressing that it is unfortunate that cynics always read meanings to the movement of the president, especially, whenever he travels outside the country. Aondoakaa, who came into the country, yesterday from an official trip to Trinidad and Tobago on the instruction of the President, noted that he is in constant touch with Mr. President in Jeddah, Saudi Arabia. He added: “What we need in Nigeria today is to be focused and wish the President well”.